All 14 of the world's 8,000-meter peaks are located in the Himalaya or the Karakoram ranges in Asia. Of the group, Everest reigns as the supreme highest mountain in the world. And yet it is a neighbor with the strange name of “K2” that many consider the harder to climb. Everest is deadly, but the ridges running up to the summit are said to be less challenging than K2. K2 is the true monster among mountains. 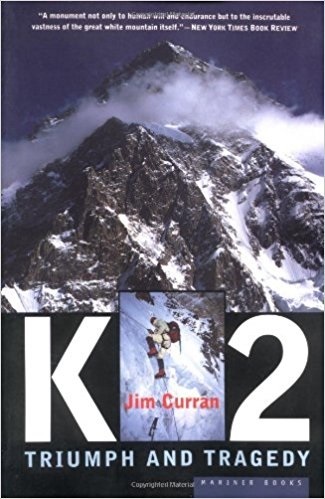 Author Jim Curran was on the mountain during the summer of 1986. His work as a climbing cameraman for the British Fullers Expedition gave him plenty of insight into the climbers and the mountain. Some of those who reached the summit of K2 that summer died on their way down. In fact, seven of the thirteen had reached the summit before disaster overtook them. Two Americans were killed in an avalanche, one man fell to his death in a crevasse just out of base camp, and seven were trapped at 26,000 feet for days. Only two would survive and they were almost dead when they finally were helped to base camp. But all was not given to tragedy. A young man named Benoit Chamoux made a historic 23-hour climb. Wanda Rutkiewicz became the first woman to summit K2. There were moments of heroism, including the author’s rescue of one of the two survivors of the summit disaster. Curran tells his story much like he lived it, one day at a time. We witness his rejoicing at the accomplishments of the climbers. We feel his anxiety when his friends are trapped for days. He shares his sorrow for the ones who were left behind, dead on the savage mountain that claimed their lives. This is a fascinating account of triumph and tragedy. I give the book four stars.